There seems to be a building concensus that the new Tau Codex may appear as early as April. 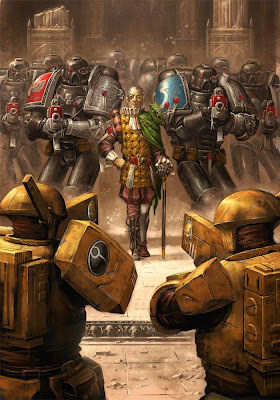 I want to be upfront right away, we do not yet know when this codex is coming, only that it is supposedly next in line. However there are some strong hints that it is coming and very soon. Lets take a look at these hints, and you can make of them what you will. Models gone from display cases at Warhammer World. While not an obvious "codex is ready" type of thing, having quite a few models missing from the display cases means that they are probably having pictures taken for a battle report, or White Dwarf article, or even for the codex itself. Here is the relevant article that discussed this. This book has not been mentioned yet, and seems to have a release date in March. At this point it seems obvious that the date will be towards the end of March. This could very well lead into a full on Tau 40k release as well. If you are looking for the full article discussing this, it was just posted last night at midnight. A big thanks to Shaso_iceborn for visiting us yesterday and joining in on the comment section. He left a nice little tidbit about the timing of Tau for the readers here, and this is it. For Tau lovers, I wouldn't worry about a backache in April as your wallet might just become a lot lighter. Here is a link to the post that the comments were left on, if you are interested in reading more of what was going on.